Can Yahoo Pump New Life Into a Dead Horse? Microsoft IE9: It's Just Plain Good! It takes more than putting an exclamation point at the end of your name to create excitement. Maybe Yahoo! is finally waking up to that. At least there were signs of it at their press event held Thursday at its headquarters in Sunnyvale, Calif.
A number of new products were announced at the forum, as well as a proclamation of a new philosophy, one that emphasizes the company as a pal for users and not just a destination on the Web. It's all aimed at making Yahoo cool again, although I can't remember when Yahoo was ever cool. The new products show promise. 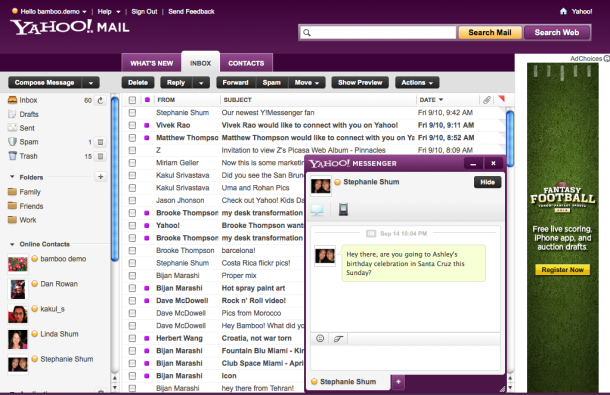 Yahoo Web mail has been rebuilt from the byte up for its 281 million users. It's faster, easier to navigate, does SMS better, improves folder creation and supports unlimited storage and attachments as large as 25MB. It even takes a stab at sorting out what's important to a user with a Priority Inbox. Yahoo's given its search pages a fresh coat of paint, too, although as Google has proven, searchers are more interested in results than pretty pages. The right hand tabs with suggestions for more content are as useful as they are attractive. What's more, the company says it has found a way to get trending topics front and center on a search page. Yahoo, of course, now depends on Microsoft Bing for its search results, but an exec at the event said that's worked out to the company's advantage. It's allowing Yahoo to "focus on the next generation of search, not just cosmetic changes." As part of its new user-oriented philosophy, Yahoo plans to integrate itself with major social media sites like Twitter, Facebook, MySpace, and LinkedIn. Sure, some critics might say that that move only shows that Yahoo is conceding it can't compete with the Big Boys. The company's answer to that, though, is it wants to give its 600 million users what they want, where they want it. If that's Facebook, then Yahoo will give them Facebook. If it's Twitter, it will give them that, too. It's a realistic and commendable strategy. The company is also reaching beyond the Web for presence. It pledged to increase its visibility in the mobile universe by investing and launching products there before they arrive on the PC. The days of simply creating mobile products by creating desktop versions are over, declared Blake Irving, who has been Yahoo's vice president and chief products officer for 100 days: "In fact, I think in five years people will type more on glass (phones) than on clickety-clack keyboards." Can new life be pumped into the dead horse that's Yahoo? The vision appears to be there to do so, although the question remains whether or not the company can deliver on that vision.